Cellfire is a company engaged primarily in electronic commerce. The company is considered as an innovator in the area of digital promotions and coupons in the United States market. Cellfire was created for the purpose of providing shoppers with the service of paperless convenience when it comes to looking for great deals and offers. The company has developed a way for manufacturing companies of consumer products to add their offers, promotions and coupons to the shopper’s loyalty card. Cellfire has made it possible to link their system straight to the loyalty-card programs of its partner retailers. With the digital connection, the company is able to provide its customers with higher redemption rates. It will also allow for a smooth transfer of data. Among the types of deals and coupons that the website offers are money-off coupons, BOGO coupons, BXGY coupons, basket off coupons and rebates. As for redemption rates, Cellfire has an average rate of 25%. Among Cellfire’s partners are Kroger and Baker’s, Dillon’s, Fred Meyer, Hilander, King Soopers, Pay Less, Safeway and Vons, Genuardis and Tom Thumb. With these retailers plus many more, the number of loyalty cards registered in Cellfire’s network total more than 80 million. Currently, more than 2 million shoppers have registered at cellfire.com in order to take advantage of the great promotions and offers that the website provides. 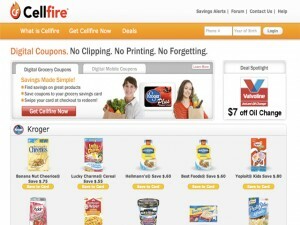 Shoppers who want to make use of Cellfire’s digital coupons have to register at the site first. To register, shoppers only need to enter their loyalty card’s number. As soon as the loyalty card has been authenticated by both retailer and Cellfire, shoppers can view and select any of the offers that are available on the website. As soon as coupons are selected shoppers can just click on the “Save to Card” icon and the digital coupon will automatically be saved on the loyalty card. Once done, shoppers just use their loyalty cards upon checkout without presenting any physical coupon. Among Cellfire’s partner brands are Nestle, Del Monte, Starbucks, Frito Lay, Kraft Foods, Kellogg’s, Sargento Bertolli, #M, Clorox and McCormick.